Ever since Abraham-Louis Breguet crafted the very first timepiece in 1810 for the Queen of Naples, Caroline Murat, the watch collection christened after her has been an embodiment of grandeur. 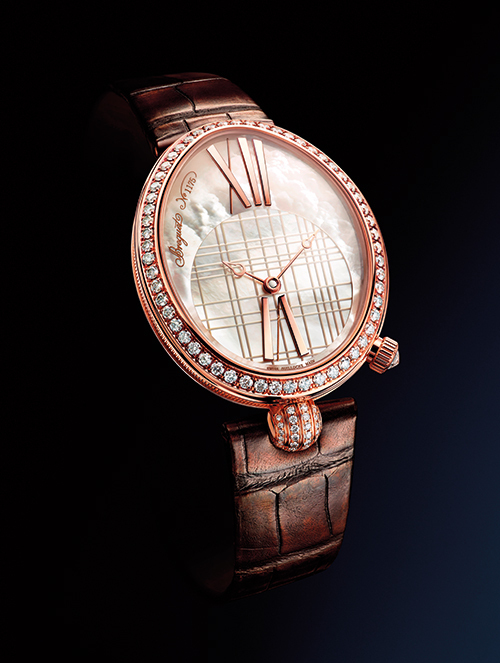 The Reine de Naples Princesse 8965 preserves this repute with the delicately cambered contours of its rose-gold case, a resplendent curved mother-of-pearl dial, rounded rose-gold hour markers at 6 and 12 o’clock and noteworthy guillochage work. Also available with a silvered-gold or anthracite dial, it has clean-cut lines that complement the 83 brilliant-cut diamonds on the bezel and lug, as well as a crown set with an inverted diamond. The numbered and signed self-winding movement, calibre 591C, boasts 25 jewels, an escapement wheel, in-line Swiss lever and balance spring — all in silicon — and a 38-hour power reserve. An elegant alligator leather strap holds it all together, its gold folding clasp sparkling with 29 brilliant-cut diamonds to guarantee the watch’s head-turning appeal.